1. I live in outside of the US. Can you ship a bunny to me please? At this time, we only ship to the US, but we are doing our best to open up our shipping internationally. 2. I forgot to use my coupon code. Can you add it for me? Also, I just saw a BIGGER discount. Can you change my discount after I've already purchased my bunny with another code? We’re sorry! We can’t retroactively add coupon codes to your order or refund the difference. We also can't discount your purchase any further once you've made your purchase. 3. Can you see the stitching on the other side of the ear? Yes. However, it’s so fluffy and cute you barely notice. 4. 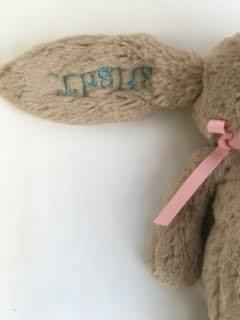 When will I receive my monogrammed Jellycat bunny? We typically take 7-10 business days to process your orders. However, during OUR BUSIEST SEASONS, IT COULD TAKE 10-14 DAYS. If you have an urgent request, please email us in advance. You will receive an email from us when your order has shipped with tracking information. 5. 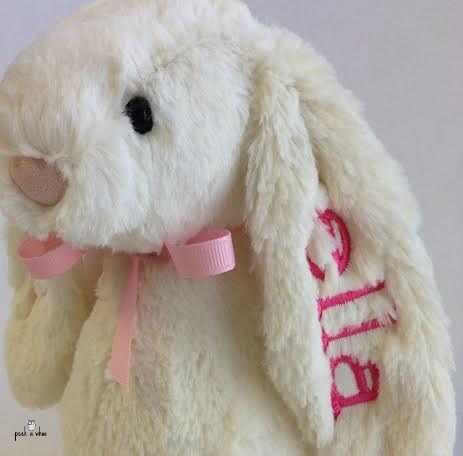 I got an email saying my Jellycat bunny has shipped, but there's no information on the USPS website/no tracking information is showing up. Please give the USPS time to pick up and scan your package. 6. 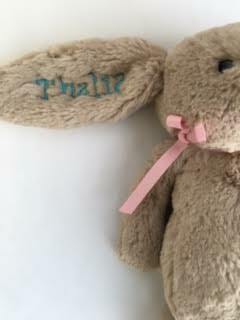 Can I change my Jellycat bunny color? Can I change my font? Can I change my thread color? Please make sure you have triple-checked your order for accuracy and that you’re happy with your choices. 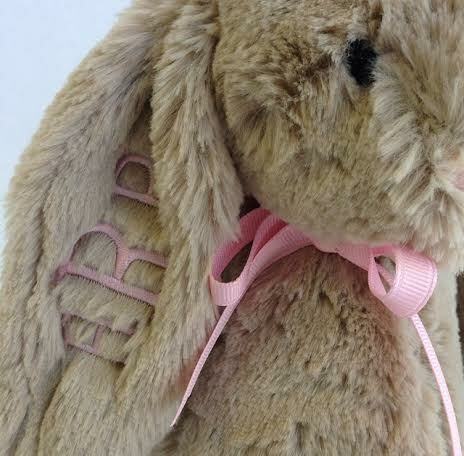 We cannot make changes to your thread colors or fonts or bunny colors after you’ve ordered. 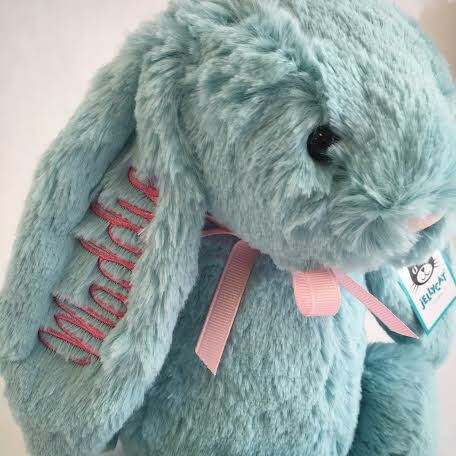 Please see below for a gallery of our most popular bunnies colors and fonts. 7. My order is wrong! What should I do? 8. My package says it was delivered but I don't have it. What should I do? Occasionally, our packages get picked up by neighbors, friends, kids, spouses...please ask around! If they don’t have answers, please ask your mail carrier for more information. 9. I think my package was stolen off my front porch. What should I do? We are so sorry! That’s terribly frustrating. Unfortunately, we cannot replace stolen items. 10. Can I add something to my order? Once your order is placed, we can’t add anything to it. But we would LOVE for you to place another order! 11. I can't decide on a font or color!! Will you send me a preview? Our amazing new monogram maker will do this for you!! Yay!! 12. I haven't heard ANYTHING FROM YOU since I ordered/ I never received a confirmation email with an order number! Please check your spam folders for your email confirmation. If it’s not there, please check paypal to ensure that your order went through. If there’s nothing there, chances are likely that your order did not go through. 13. I don't have a paypal account and I used a credit card, but I still received a receipt from Paypal. We use paypal as our payment gateway and processor, so though you don’t have an account, you will still receive a receipt from paypal. 14. I received an email that my order is pending. It's still pending! What does this mean? Our website will send you updates on the status of your order. “Pending” means we’ve received your order and printed it for processing. You will receive another email once your order has shipped. 15. I can’t tell which bunny is biege. Or cream. When you choose that particular bunny color out of the drop down, that bunny will appear in the image gallery. 16. 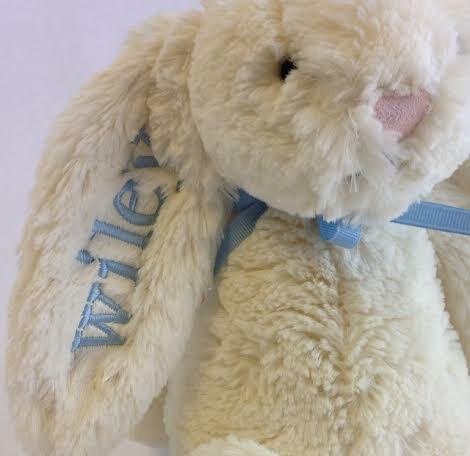 How will my Jellycat bunny be wrapped? 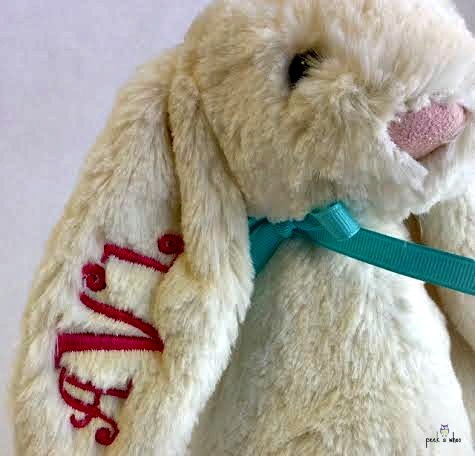 Your Jellycat bunny will come with a coordinating bow tied around its neck. If you've written a gift message, we will include a gift note. All bunnies come in a clear cellophane gift bag. 17. Will I receive a receipt in my package? You will be emailed a receipt-there will not be a paper copy in with your package. 18. I let Peekawhoo Pick and I don't like what you picked! Oh no! We're sorry! We choose fonts and colors based on what's trending in the studio and on years of experience with our products. Unfortunately, we cannot replace your items once you've received them. 19. 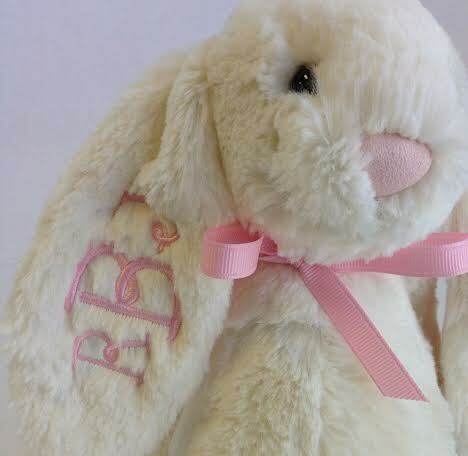 I would like to add a monogram, name, or date to the other ear. Is this possible? We would be happy to add embroidery to the other ear for an additional $10. If you're interested, please email us at [email protected] with "Adding embroidery to other ear" in the subject line.